A 2-1 second-half lead was lost in defensive mistakes as the Sounders were booted from the U.S. Open Cup 4-2 by the Galaxy in Los Angeles Wednesday night. 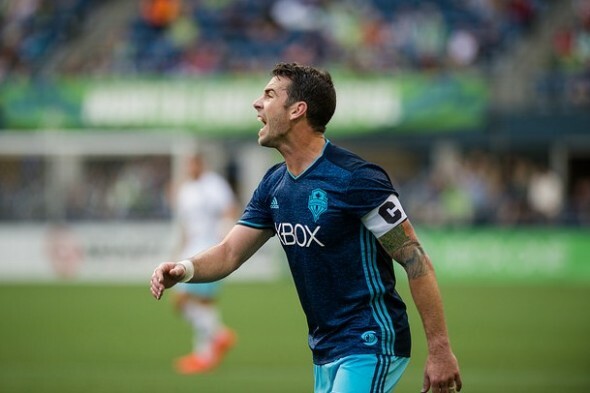 Despite taking a 2-1 lead in the second half, a pair of defensive blunders cost the Seattle Sounders the game as they tripped up against the Galaxy in Los Angeles, 4-2, in the quarterfinal of the Lamar Hunt U.S. Open Cup Wednesday. Seattle crashed out of the tournament after becoming defensively unbound in the final half-hour, surrendering three unanswered goals. “We gave up a soft goal and from there the flood gates opened,” coach Sigi Schmid said. “I think all of the last three goals were soft goals. It’s a game we should have won. In a season where nothing has gone according to plan, the Open Cup had, in recent weeks, looked like Seattle’s best chance to add a trophy to its collection this season. Mired in ninth in the Western Conference standings, nine points back from a playoff spot, it seemed that the Open Cup might take on increased importance. Seattle passed on that idea Wednesday night. The selection of the 18-man roster made it clear that the Sounders are all-in for the MLS Cup, not the Open Cup. Andreas Ivanschitz, Osvaldo Alonso, Chad Marshall and Erik Friberg did not travel with the team. Instead they will travel straight to Kansas City ahead of Seattle’s match against SKC Sunday (12 p.m., ESPN). The Open Cup, the oldest competition in the United States, and the third-oldest continuously operating soccer competition in the world, still doesn’t carry the same prestige that the MLS Cup does. The Sounders, eager to record a cup on the heels of Portland’s triumph last season, have sought hardware to help stay a top-tier MLS club. Zach Mathers, a rookie midfielder from the reserves who appeared in each of Seattle’s last two Open Cup matches, got a start at midfield. Aaron Kovar and Oalex Anderson took up spots on the right and left wings, respectively, with 34-year-old Herculez Gomez at striker. Zach Scott was the veteran center back, providing guidance to rookie Tony Alfaro playing alongside. Michael Farfan, limited by injury for most of the season, opened the scoring in the fourth minute when he broke free and chipped LA keeper Clément Diop. The Galaxy responded in the 17th minute when Alan Gordon smashed a low cross into the upper portion of the net. The Sounders put themselves into a position to win when Gomez leaped up to meet a long cross at the back post and tap it in to give Seattle a 2-1 lead in the 59th minute. Los Angeles sensed trouble, and moved quickly to recapture initiative. It subbed in two of its first-team forwards, Giovanni dos Santos and Gyasi Zardes, who have scored a combined 11 goals in league play, in the 74th minute. It took three minutes for the Galaxy to capitalize. Scott, under pressure from Zardes, gifted a one-on-one to dos Santos after a bad pass across the middle. He scored past backup keeper Tyler Miller, leveling at 2. Sebastian Lletget scored two more goals to put the game out of reach. The first came in the 85th minute when he ran behind Alfaro to be on the end of a cross from Baggio Husidice. The second came in the 88th after working a give-and-go with Zardes to play himself into the penalty area. If Seattle can take anything from Wednesday’s implosion to Kansas City, it must be a grim sense of purpose. Unless the Sounders can turn their league form around, there won’t be much left to play for come October. “It’s a game we should have won.” Nice coaching, Sigi. Time for Schmetzer?